글라도스(GLaDOS) (Genetic Lifeform and Disk Operating System(유전적 생체모형 디스크 관리 체계)) 는 조종을 위한 중앙 코어로 제작되었으며, 피실험자들을 안내하고, 애퍼처 사이언스 컴퓨터 보조 강화 센터를 감독합니다. 시설 및 다양한 테스트실을 이동시키는 등, 중앙 AI 격리실에 있는 동안 거의 무한대의 실험을 진행할 수 있습니다. 여성으로 프로그래밍 되어 있고, 포털과 포털 2에 악당으로 (2편에서는 싱글 플레이의 앞쪽) 등장합니다. 나머지 뒷쪽에는, 게임의 트리타고스트(무대에서 세번째로 중요한 사람을 이르는 말)가 됩니다. 게임의 협동 캠페인에서, 글라도스는 아틀라스와 피-보디의 감독관이 됩니다. 글라도스의 성우는 엘런 매클레인 입니다. 글라도스는 애퍼처 사이언스에서 만든 인공지능으로, 중앙 컴퓨터 메인 프레임에 장착할 수 있는 코어로 설계되었습니다. 이 프로젝트는 회사의 CEO인 케이브 존슨의 감독하에 시작되었고, 완전히 가동하는 상위 인공 지능을 개발하는 도전이자 존슨이 죽음을 회피하기위해 했던 방법의 하나였습니다. 하지만 월석 중독으로 인해 글라도스의 개발이 완료되기도 전에 죽게 된다는 것이 명백해지자, 그는 인격 코어를 그의 비서였던 캐롤린에게 맞추라고 지시합니다. 수십년의 고된 노력 끝에, 글라도스는 많은 사건이 일어났었던 1998년에 공식적으로 활성화되었으며, 이 날은 회사의 "당신의 자식을 직장에 데려오는 날" 이었습니다. 글라도스가 시설의 기능을 절반 이상 제어하는게 가능하던 때, 글라도스는 Enrichment Center를 가득 채우던 사람들을 신경독으로 없애버리기 시작합니다. 그러나, 글라도스의 공격을 피해 살아남은 극 소수의 직원이 있었는데, Doug Rattmann은 신경독을 피해 살아남았고 포탈 시리즈의 주인공이 될 첼과 함께 도주합니다. 회사가 붕괴됨과 동시에 지구는 외계의 침략을 받고 있었는데, 이는 에피쳐 사이언스의 경쟁 회사인 블랙 메사에서 이틀 전에 일어났습니다. This ultimately led to the negligence of the outside world from realizing Aperture's fate, as all attention had been diverted to Black Mesa and the aforementioned invasion. Since the attack, she has managed the company to her limits. Her first test subject and the series' main protagonist, Chell, was given a warning of GLaDOS' true colors with the help of Rattmann. She confronts GLaDOS in her chamber at the end of Portal, which allowed GLaDOS to develop an even deeper hatred for her after she was awakened in the beginning of Portal 2. GLaDOS in Portal, with personality cores attached. Prior to the events of Portal, one of Aperture's technicians, Doug Rattmann, successfully evaded GLaDOS' attempts to flood the Enrichment Center with neurotoxin. He then took refuge in several departments throughout the facility and began tampering with the initial test subject roster, rearranging Chell to the top of the list as Test Subject #1 instead. 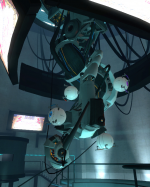 Since GLaDOS initiated a lockdown, Rattmann was forced to live his whole life hiding between the backstages of Test Chambers in the Enrichment Center. He then left various warnings of GLaDOS through graffiti that could only be found behind several corrupted wall panels in Test Chambers, in hopes that Chell would later stumble upon them. GLaDOS was able to operate the company all while residing in her Central AI Chamber, despite lacking full control over the facility. She then awakens Chell for her mandatory testing of the Handheld Portal Device, which began the events of Portal. During these time periods, she had constantly intimidated Chell during her performances and given bitter yet innocent sarcastic notions by simply acting out like conveniently placed pre-recorded messages. Several tests later, Chell would later discover the various graffiti left behind by Rattmann and immediately became aware, but was forced to played along with GLaDOS' plans. After Chell completed the final test chamber, GLaDOS immediately revealed her true colors as she attempts to lower her into a pit of fire. Chell was able to escape her attempt to incinerate her and from there, Chell makes her way throughout the facility to escape. She later had no choice but to confront GLaDOS in her chamber as there was no chance of escaping, a conflict which Chell won. At the conclusion of the conflict, GLaDOS was heavily damaged, and remained in a dormant status for an unspecified amount of time as the facility degraded over the years. The remains of GLaDOS after her conflict in Portal. 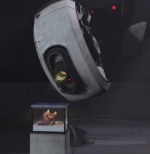 Beginning the major events of Portal 2, GLaDOS is reactivated through the accidental efforts of both Wheatley and Chell having tried to access an escape lift to the surface in the Central AI Chamber, as both of them were previously trapped in the building following GLaDOS' destruction. She immediately realizes the presence of Chell and Wheatley standing before her upon awakening. Despite her newly profound hatred for Chell having destroyed her, she uses Wheatley as an object for relieving her anger by crushing him. GLaDOS then decides to return Chell to the facility's science experiments to further her cause of science, but often makes various taunts in hopes to crush her morale. GLaDOS lowering a neurotoxin tube, with Wheatley rolling inside. However, Wheatley later resurfaces and was still alive despite the critical damage inflicted onto him by GLaDOS. With his help, Chell was able to escape from GLaDOS' testing tracks and went through the facility to sabotage her vital strategy components, such as the production of neurotoxin. Finally reaching her newly redesigned chamber, they were then able to defeat GLaDOS together, replacing her with Wheatley as the facility's overseer. Wheatley, intimidated by GLaDOS' response to how useless he is, traps GLaDOS in a potato battery and throws her into the depths of the Enrichment Center alongside Chell. After Wheatley became corrupted by his new position and power, GLaDOS and Chell worked together, initially as unwilling partners, to restore control over the facility (which further degraded and corrupted under the influence of Wheatley, to the point where the facility's reactor core will undergo a meltdown). During this time, the duo try to find their way out of the depths of the Enrichment Center where they approach several vintage Test Chambers previously managed by Aperture CEO, Cave Johnson and his secretary Caroline. As Chell and GLaDOS continue to journey through the pasts of Aperture Science located in the salt mine deep beneath the Enrichment Center, GLaDOS slowly becomes familiar to Johnson and Caroline. As they are finally ready to leave the salt mine, GLaDOS has an epiphany on who Caroline is but remains silent on the matter. GLaDOS, uploaded to a potato battery. The duo then have made their way back to the modern Enrichment Center, where Chell and GLaDOS were put through Wheatley's testing tracks. When Wheatley later realizes that GLaDOS had built two robot test subjects prior to Chell and Wheatley's sabotage over the facility early on in the game, he finally attempts to dispose both GLaDOS and Chell. When the duo manages to escape from his grasp, they head to the Central AI Chamber to confront him. GLaDOS proposes that Chell is to attach her back into her body to resume her control over the facility. The conflict was then resolved by their conjoint efforts, resulting in the exile of Wheatley to outer space and a reconciliation between each other. GLaDOS during the single-player ending monologue. After repairing the entire facility to its state prior to Wheatley's control, GLaDOS begins to become even more affected by her recently acquired morality, emotions and gained her own consciousness after discovering who Caroline was. She realizes that Chell was not an enemy, but could be considered a close friend. Part of her "rogue AI" nature disagreed with this change of heart. 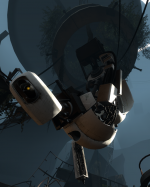 GLaDOS was then able to trace Caroline's consciousness in her system, moments before the Announcer reveals that GLaDOS has deleted Caroline from her system. She then expels Chell from the facility in order to avoid further trouble beyond her control. However, Chell is then comforted through her elevated ride to the surface by a Turret Opera which remains unknown as to why the event occurred. Before Chell could leave the Enrichment Center for good, GLaDOS decides to return Chell's Companion Cube from her tests in Portal by ejecting it from the lift before the door to the Enrichment Center could shut itself. From then on, she conducts tests on the two robot test subjects; Atlas and P-body. Sometime after Chell is freed from the Enrichment Center, GLaDOS has been primarily focusing on her two new android test subjects Atlas and P-body, as part of the Cooperative Testing Initiative. Typical to her nature, she would constantly find a way to crush their spirits via sarcasm and expressing herself to be having little hope for them. At the end of the first testing course, Team Building, she deploys the bots outside the official testing track, announcing that "this next test is so outside the box that I can't- I mean WON'T even tell you what you're looking for". She leaves the bots to use common sense to figure out what they should be looking for by themselves, as they find a large disc and bring it into a projector room. Despite the clear warning "DO NOT TRUST HER" written on a whiteboard in the room, the bots place the disc into the projector - in which she begins scanning for files and documents she refuses to disclose. After she was done, she initiated a self-destruct on the bots and reassembled them back at the Hub. This topic remains untouched through the entirety of their second testing track, Mass and Velocity. However, at the end of this course, it became clear that she would continually send them outside the testing tracks again to handle her secret full takeover on the facility. As Atlas and P-body work together to get each other past the air circulation maintenance section, they find another disc and installs it into the projector. GLaDOS again scans through and proceeds to tells them that she did not really need them to do this, and pretends their mission did not matter after self-destructing them again. When the bots reach the third course, Hard-Light Surfaces, GLaDOS' utter disappointment in the duo becomes more clear. With their "deaths" never bringing the satisfaction she had with the death of humans, as the bots can just easily be rebuilt again each time they are destroyed. Meanwhile, she is secretly working on an attempt to replace Atlas and P-body. At the end of this course, the bots install a disc which contains the Enrichment Center's current overall security code, which she tries to block out from their range of hearing by uttering "blah blah blah" repeatedly as the Announcer relays the codes. In the fourth course, Excursion Funnels, GLaDOS builds slight hope in keeping Atlas and P-body still as predicted by her sudden change of mood from the previous course. She now wants the bots to feel conflicted against each other - hoping to enhance a more "competitive" and bitter testing run, simply by manipulating them into thinking that one of them has been "reporting" to her behind the others' back, or how P-body is "not [Atlas'] first cooperative testing partner". The bots still carry on regardless, where GLaDOS' disappointment in the two reprises in her tone of voice. On the last test, she gets them to install the final disc to her full control over the facility - assuring them it was a clerical error by humans on how it was not done any earlier before they died. As the bots install it, overview maps of every section of the facility begins projecting onto the screen, followed by her mischievous yet anticipated tone of voice when revealing that "[she] can see everything now". Atlas and P-body upon reaching the Human Vault. Reassembled back at the hub, GLaDOS tells the bots that they have just one more testing course to complete - Mobility Gels. She deploys the entrance to this course into the hub, and sends them deep beneath the Enrichment Center to the Aperture Science Innovators era, a bottom section of the salt mine. GLaDOS convinces them to rescue the "dying, trapped, crying" live human test subjects preserved in a cryogenic vault that were preserved since the 20th century. Once they finally reach to this vault at the end of the course, GLaDOS reveals a great deal of anticipation and obsession over "rescuing" them. In attempt to unlock the vault, the bots had to perform gestures like any human would - as the vault was an anti-robot section. Despite how sinister she sounded after the bots observed the hundreds of humans in cryogenic stasis, they disregarded it and began dancing in triumph. Now extracting all of the human test subjects, she begins processing their files - which apparently turned out to be only one person's file. As she no longer needs Atlas and P-body as her test subjects, she began testing the humans in an attempt to develop them into her cold minions. Her plan fails as the humans are unable to withstand her extreme testing courses and all of the hundreds of test subjects that were found began dying within just a week of testing. It became apparent that she absolutely needed Atlas and P-body back as her facility began to malfunction all of a sudden, in addition to her lack of test subjects. Central core prototype seen at the end of Art Therapy. When the bots are rebuilt again, she deploys the additional testing course; Art Therapy. As the bots begin testing, she treats the course as if it were an art museum despite the obvious malfunctioning environment such as her lack of control in putting the test chambers together properly, and a flood arising around a section of the facility during testing. Eventually, the reassembly machines have begin malfunctioning - causing her to wait three days before the robots could be reassembled to deliver the duo to their next test chamber. GLaDOS then gives in and confesses that she is in need of their help and that someone has been tampering with the facility via control of an old prototype chassis of the central core. To resolve this, she trains the bots into becoming her "killing machines" by deploying them into more challenging tests during their course. GLaDOS then sends them closer to the chamber housing the chassis, and later jokingly calls them as her "Special Team Falling Into Acid Force". When the bots reach the chamber, they discover it was never a person, but even worse - a bird nesting above the keyboard on the machine. GLaDOS, already aware of it being a bird since the beginning, panics and instructs them abort the mission, before P-body closes a hatch that the bird flew out from. As the bots stare at the chassis, GLaDOS panics that the bird had been "gestating clones" on the keyboard and forces them to destroy the eggs. With the bots hesitant, she conjures a better idea and houses the birds in the Central AI Chamber, where she could nurture them directly. GLaDOS begins to show compassion toward the birds as she realizes their ability to use their beaks and considers them as test subjects, also revealing a more motherly bonding with the birds than she ever did with the "mushroom" bots. The fate of these birds remain unknown until further test courses are added. As the Perpetual Testing Initiative offers a wide range of alternate universes for the player that is going through community test chambers - dubbed the "multiverse", Aperture CEO Cave Johnson still lives and is as healthy as he was before being struck by exposure to moon rock poisoning in the main reality. However, all of the universes which form multiverse have the same outcome in which all development on GLaDOS has been abolished after her first activation when she went rogue. In addition to her being abolished, Cave's loyal assistant Caroline has been replaced with Greg. It is unexplained on exactly what did happen to Caroline, although serving as a hint that she may have merged with GLaDOS, thus explaining her absence from this era. In this same universe after she was abolished, Cave also tries pushing the scientists into making a Cave-Bot instead. In one universe Cave successfully becomes an AI (known as "CaveDOS") and it's unknown what happened to Caroline. As the overseer and operator of the facility, GLaDOS is seemingly omnipotent, able to reconfigure rooms and carry out actions at her will. She monitors the facility and its test chambers through cameras mounted on walls. She also mentions that she cannot resist thinking of paradoxes if one would happen to be brought up. GLaDOS had displayed little to no emotion within her voice tone in the first half of Portal, due to being bound by the consciousness of other personality cores attached onto her for the sole purpose of restricting her true thoughts. She then becomes increasingly more agitated and is portrayed as a narcissist during Chell's escape attempts. In Portal 2, she grows bitter after the events of Portal, frequently insulting Chell until the very end - until she briefly realizes that Chell was "all along [her] best friend". GLaDOS' consciousness had been controlled by personality cores throughout the events of Portal. If the cores are removed, the traits and morals which the cores contain would be permanently detached from GLaDOS as well, causing her to fall back to her more human and intimidating voice tone, resembling to that of her Genetic Lifeform component Caroline. GLaDOS' status as the central core allows her to have various controls over the Enrichment Center. Apart from being able to build, reconstruct or deface test chambers, GLaDOS is able to provide the pneumatic pressures serving as the vacuum inside the tube networks across the facility - a power which the Announcer could only handle the elevator tube shafts in the chamberlocks. In Portal, GLaDOS was able to steer away the vacuum directions inside the tubes and managed to pull Chell back into Test Chamber 09 after the latter attempted to travel inside a burst tube. It was eventually revealed in Portal 2 that GLaDOS was also able to reconstruct the components on her own body as well, now without the cores restricting her thoughts. She had replaced most of the broken and or missing components on her body since her reawakening in the chapter, The Courtesy Call. Her newer components spotted on her body since the chapter The Escape are sleek and black, and is of little resemblance to the original ones from her body during the reawakening and Portal. Earliest known concept art of GLaDOS. During Anime Midwest 2011, voice actress Ellen McLain revealed that the premise of GLaDOS had always been a robotic voice that would guide the protagonist and often intimidates them. Early on development, Valve had used copyrighted voice samples as a placeholder for GLaDOS. As Ellen McLain previously voiced the radio communications dispatcher of the Combine Overwatch throughout the Half-Life 2 saga, the developers had chosen her for the role of GLaDOS. During this time, developers had kept the development quiet, leaving Ellen unaware what game it is that she is doing voice work for. Ellen was later made aware of her work and success when Portal was finally released. In Portal 2, GLaDOS' dialogue shortly after her awakening were originally much more insulting. As playtesters grew uncomfortable with her insults, it was then decided that GLaDOS continues her passive-aggressive behavior which she began from the Portal credits song, Still Alive. 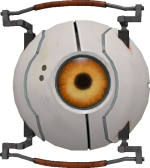 When it was decided that GLaDOS and Chell needed to work together to face Wheatley, Valve opts for GLaDOS to be uploaded into a potato battery. Writer Jay Pinkerton describes the transformation as "a very stark difference between this imperious, all-powerful GLaDOS talking to you, and this powerless GLaDOS talking to you on your gun", and that potato GLaDOS was initially needling towards playtesters. To counteract this, she was made into a more sidekick type of character. 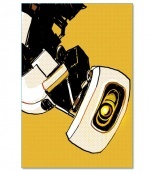 Appearance-wise in Portal, GLaDOS' initial designs prior to the game's release varied greatly. 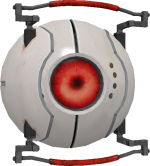 The earliest known design of GLaDOS was a large disc with a red eyeball in the center, with the disc surrounding it and welded onto the eyeball. This concept of GLaDOS appears to be the most favorable version towards several community members and was then recreated for use on a character entirely for the community-made machinima series, The Underground. 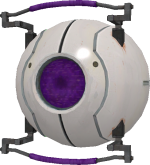 Later on in development, the design of the large eyeball was then scrapped into a robotic body hanging upsidedown from the ceiling, with four discs surrounding above it this time. This concept has since been kept for the release of Portal, with minor adjustments such as the addition of personality cores. 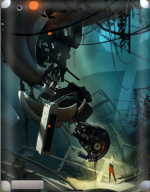 The earliest known concept art of GLaDOS' design for Portal 2 was through one of the many concept box arts; demonstrating that her body's plating was completely torn and scrapped, leaving only her head the most intact - nearing the design of her spherical-cylinder shaped head in the game's release. She had also been given a red eye color in this concept rather than her trademark yellow that was given to her in Portal. Not much else is known of her design changes during the sequel, except that the developers established that the current design of GLaDOS in Portal 2 was to signify a more antagonistic appearance and shape. 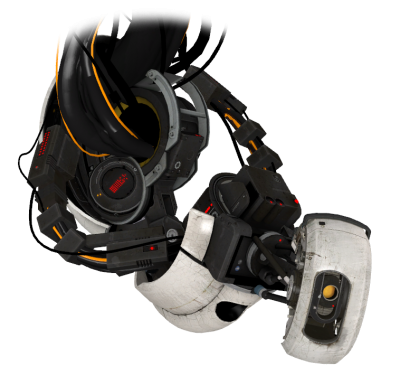 In addition, an unused reskin of GLaDOS' design from Portal can be found in the game files of Portal 2, presenting rust stains and scratches possibly to be used for her components scattered around in her chamber. GLaDOS' remains in comparison to Chell. GLaDOS' body after her awakening, slightly resembling her Portal model. GLaDOS, redesigned with newer components and losing Portal resemblance. GLaDOS in comparison to Chell. GLaDOS in her redesigned Central AI Chamber. Another view of GLaDOS in her redesigned AI chamber. Side view of GLaDOS after her reawakening. Side view of GLaDOS in her upgraded body. GLaDOS during her forced core transfer. Centered view of GLaDOS during her core transfer. GLaDOS, dragged by Wheatley for an extraction process. GLaDOS, uploaded to a potato battery by Wheatley. GLaDOS after being attached to Chell's Portal Gun. GLaDOS regains her head while being dragged back into the central core. GLaDOS and the baby birds in the co-op course, Art Therapy. GLaDOS' portrait from the official Aperture Science Collaborative Disposition Test. 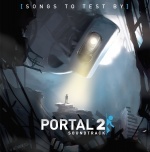 The Portal 2 Soundtrack cover. GLaDOS and Chell on the "Aperture's Requiem" lithograph. GLaDOS and Chell on an iPad gelaskin. Concept art of GLaDOS' core transfer. GLaDOS and Randolph the Red-Nosed Turret. The acronym "GLaDOS" is a pun of the name "Gladdys" and the term DOS (Disc Operating System). Ellen McLain, the actress that voices GLaDOS, also provides the voice for the Administrator in Team Fortress 2 and the Combine Overwatch in the Half-Life series. This makes Ellen McLain the only voice present in every game included in the The Orange Box. The most favored character that Ellen McLain has voiced is none other than GLaDOS. She reveals that despite the hard effort in pulling off the voice of the Administrator from Team Fortress 2 and her unique way of ordering things, GLaDOS' character had a greater impact on her through her popular passive-aggressive behavior and subtle insults. During the development of Portal 2, playtesters were uncomfortable with GLaDOS as she was far too vindictive in the single-player campaign, and the developers concluded that some of her dialogue was too extreme. Due to this, elements of her dialogue were reworked, which resulted in the creation of a more amicable, passive-aggressive personality for GLaDOS. 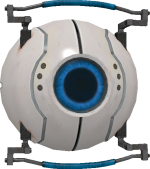 In the single-player campaign of Portal 2, Wheatley would only refer to GLaDOS as "her" or "she". When in her potato battery form, she is commonly referred to by the community as "PotatOS;" this nickname is derived from the word "potato" and her name, GLaDOS. Valve favored this nickname and placed it as her official name when in her potato battery form, as shown in the Portal 2 Soundtrack "PotatOS Lament". On the 2011 Video Game Awards, Portal 2 had won the award for "Best Performance by a Human Female" for Ellen McLain's role as GLaDOS. This page was last modified on 30 June 2017, at 08:35.